In my previous post I explained why there will be a Drupal 9 even though we have previously unseen possibilities to add new things within Drupal 8.x.y. Now I'd like to dispel another myth, that initiatives are only there to add those new things. Drupal 8 introduced initiatives to the core development process with the intention that even core development became too big to follow, understand or really get involved with in general. However because there are key areas that people want to work in, it makes sense to set up focused groups to organize work in those areas and support each other in those smaller groups. So initiatives like Configuration Management, Views in Core, Web Services, Multilingual, etc. were set up and mostly worked well, not in small part because it is easier to devote yourself to improving web services capabilities or multilingual support as opposed to "make Drupal better". Too abstract goals are harder to sign up for, a team with a thousand people is harder to feel a member of. Given the success of this approach, even after the release of Drupal 8.0.0, we continued using this model and there are now several groups of people working on making things happen in Drupal 8.x. Ongoing initiatives include API-first, Media, Migrate, Content Workflows and so on. Several of these are primarily working on fixing bugs and plugging holes. A significant part of Migrate and API-first work to date was about fixing bugs and implementing originally intended functionality for example. The wonder of these initiatives is they are all groups of dedicated people who are really passionate about that topic. They not only have plan or meta issues linked in the roadmap but also have issue tags and have regular meeting times. The Drupal 8 core calendar is full of meetings happening almost every single workday (that said, somehow people prefer Wednesdays and avoid Fridays). If you have an issue involving usability, a bug with a Drupal web service API, a missing migration feature and so on, your best choice is to bring it to the teams already focused on the topics. The number and diverse areas of teams already in place gives you a very good chance that whatever you are intending to work on is somehow related to one or more of them. And since no issue will get done by one person (you need a reviewer and a committer at minimum), your only way to get something resolved is to seek interested parties as soon as possible. Does it sound like you are demanding time from these folks unfairly? I don't think so. As long as you are genuinely interested to solve the problem at hand, you are in fact contributing to the team which is for the benefit of everyone. And who knows, maybe you quickly become an integral team member as well. Thanks for contributing and happy team-match finding! Ps. If your issue is no match for an existing team, the friendly folks at #drupal-contribute in IRC are also there to help. Read more about Want to get issues resolved in Drupal core? Find community with an initiative! Drupal 8 makes huge-huge strides in terms of reaching more people on the globe by making everything translatable and automating translation downloads and updates from the community among hundreds of other improvements. What about software translation contribution though? We did not make progress on that front in core, but it is not very hard to do as a contributed module. 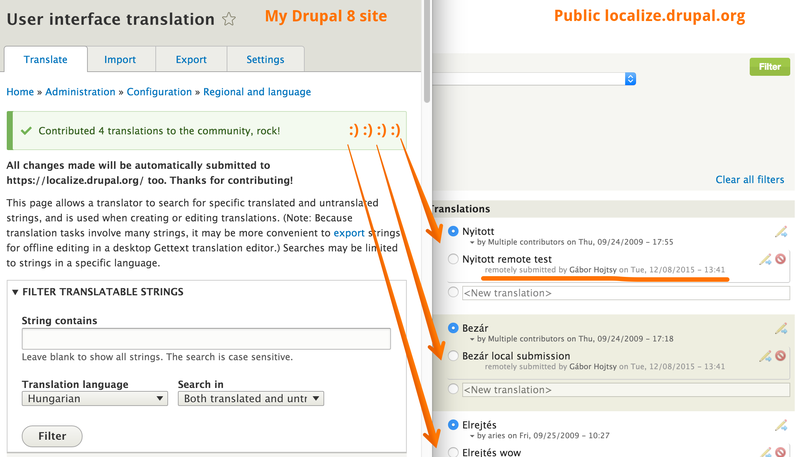 The Localization client module is available for Drupal 7 and 6. It does two things: it provides an alternate nicer user interface to translate Drupal (modules) and it allows you to contribute to the community right from that interface. Drupal 8 already improved the built-in translation interface considerably, so it made sense to start with porting the contribution functionality and integrate that first. The initial Drupal 8 port of that is available for your testing now! Join the https://localize.drupal.org/ team you want to contribute translations to (if not already). For testing, you can use the test language. Or better: just test with good translation suggestions so your reviewers will be happy. Grab the Drupal 8.x-1.0-alpha1 version of Localization client. Install the Localization Client Contributor submodule only (you would not be able to install the other one yet anyway). The module comes with contribution enabled by default, but you need to set your API key so localize.drupal.org can identify you. Edit your user account on your site and enter the API key there. (Follow the instructions on the API key field on your user account edit screen). If you want to grant other people to contribute, grant them the Contribute translations to localization server permission to contribute and tell them to enter their respective API keys on their user profiles. Now when you go to the built-in software translation UI it will tell you that all things changed will also be submitted to localize.drupal.org and the submit button will reflect that too, to make it super-clear. If you did not set your API key yet, it will tell you to do that instead. Once submitting the translation changes, it will let you know how many strings were successfully submitted and any errors encountered as well. All messages are also logged for later review. The resulting effect of submitting changes locally are visible remotely by the community as well, yay! Happy translating! 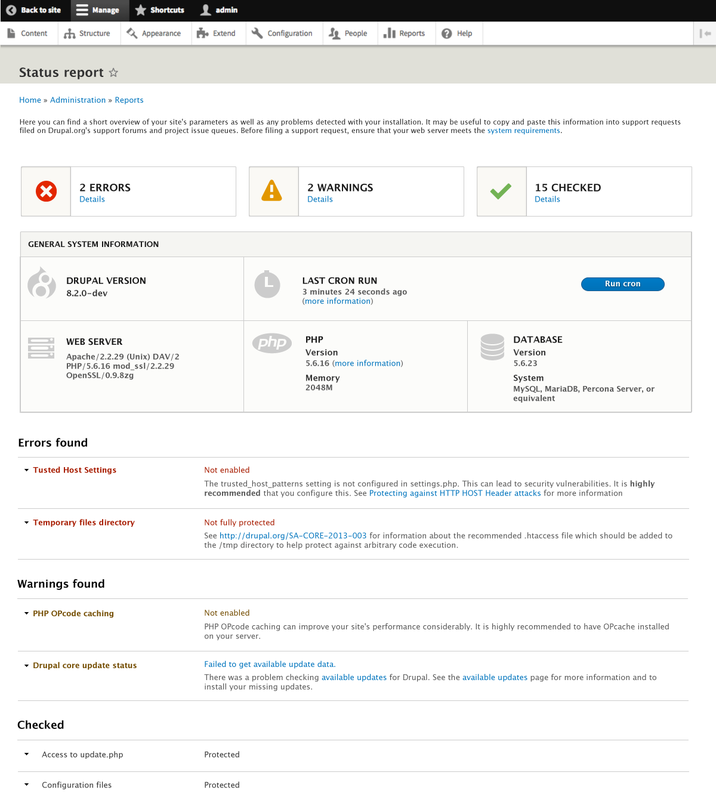 See known issues and report more at https://www.drupal.org/project/issues/l10n_client?version=8.x Further improvements are of course possible, issues are welcome!